Choosing a travel bag can be fairly complicated. Taking into account the many brands and models of bags and the different sizes and options available, it can get very complicated. Then, finding one that is large enough for all your gear but small enough to take on to an airplane without any complications is another whole matter. I managed to pack all this into a Lowepro SlingShot 300 All-Weather Camera Bag (Black). Apart from a few Filters and Compact Flash Cards, and a small Tripod I had brought nothing else along, not even an External Flash. There was not enough room for anything else. Although, I could have fit another lens or flash into the upper compartment. I chose this bag after trying out a whole slew of them at a local Camera Store. The bag is a single shoulder strap bag with a waist belt that easily slides under your arm to your front side for easy access to your gear. Access is very easy as the main compartment access panel is on the side and it is large enough to easily remove a large DSLR camera with lens attached. When properly cinching up the waist band to can remove all the weight from the large well padded 'single' shoulder strap. An upper compartment was great for small accessories and is large enough for a small easy to crumple wind breaker. The LowePro Bag is well constructed and properly padded. The built in Micro Fibre Towel and the built in Rain Cover make this a great bag. Highly recommended. I am now just about to leave for Hawaii and I have since amassed more gear and actually want to bring more gear along. Mostly, I want to bring my Canon EF 400mm f/5.6L USM Super Telephoto Lens along with the Canon EF 1.4X II Extender and a Canon Speedlite 580EX II Flash. I also want to bring my HP Mini Note Laptop so that I can backup all my images onto the 160 hard drive and to continue to blog while I am away. The existing bag with all the gear in it weighed about 11.8 Pounds. Adding the 400mm Lens, 1.4 Extender and the Speedlight 580EX will add another 4.7 Pounds for a total of 20.5 Pounds with the Laptop. Several problems here. Will my existing bag still be comfortable with the extra weight? And the biggest problem, actually a show stopper, the extra gear will not even fit into the bag! At this point I thought about using my Hiking Bag the Tamrac 5577 Expedition 7 SLR Photo Backpack (Black) but decided that it may be to large for carry on. 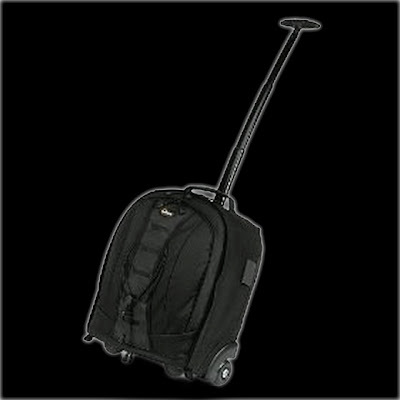 Shopping on-line for a great Air Travel bag capable of carrying the gear I want to bring along proved much more difficult to find then I had anticipated. There were no magical 'Find the Right Bag for your camera gear for airline travel' sites. I did find many sites that talked about various bags, some good and others not so good. After looking everywhere on the Net and spending a lot of time at Manufacturers sites I went to my usual place to buy, Amazon.com. By this time I had already narrowed my choices to two bags. One was the Tenba 632-333 Shootout Large Backpack with Wheels (Black) and the other was the Lowepro Rolling CompuTrekker Plus AW Camera Bag. Both these bags seemed to be large enough to carry all my gear and yet small enough for carry on air travel. What caught my eye the most was the fact that both these bags had wheels. Yes, they were both 'BackPack' style bags but both had wheels and extension pulling handles. I would no longer have to carry my bag around the airport for several hours. After reading reviews on Amazon.com and other sites about these two bags I decided on the LowePro. It has been ordered and I will write a review on the bag after I return from Hawaii. Until then, Aloha! Please feel free to leave comments, corrections, ideas or suggestions.